China is expanding the ranks of the famed Terra Cotta Warrior army with new excavations. They are expected to yield hundreds more of the ancient life-size figures. The museum overseeing the vast mausoleum of China's first emperor says it began work March 30 on the tomb's No. 2 pit. It is smaller in scale but believed to be richer in archaeological value than the already excavated No. 1 pit. Along with 1,400 warrior and horse statues, the pit is believed to contain 89 war chariots and 116 mounted soldiers. They offer invaluable insights into the military culture of the Qin dynasty. That is according to the museum website. "The No. 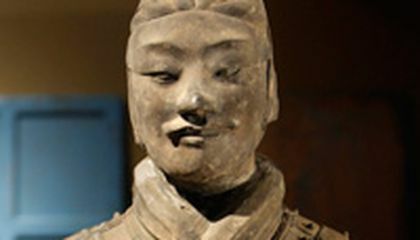 2 pit contains the true essence of the Terra Cotta army," the museum's former curator was quoted as saying. 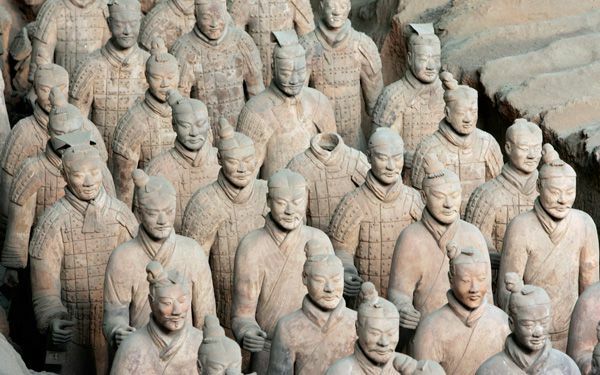 The Terra Cotta army was discovered in 1974. It has become one of China's biggest tourist draws. It attracts hundreds of thousands of visitors each year. The warriors have joined the giant panda as a tool of Chinese "soft power." Several batches are being exhibited overseas to enthusiastic crowds. The army was built to guard the tomb of the first Qin emperor. His name was Qin Shi Huang. He died in 210 A.D. During his lifetime, he conquered much of what is now modern China. In all, the tomb contains three pits. They are thought to hold more than 8,000 figures. Archers, infantry soldiers, mounted cavalry, horse-drawn chariots, officers, acrobats, musicians and others are included. The third pit is adjacent to the emperor's sprawling mausoleum. It lies under a 250-foot mound and remains un-excavated as experts debate the pros and cons of doing so. Ancient accounts tell of a huge complex of chambers, including underground rivers filled with flowing mercury. There are also the remains of craftsmen and imperial concubines sealed alive in the tomb with the dead emperor. The Terra Cotta statues weigh about 400 pounds each. They range in height from 6 feet to 6 feet 5 inches depending on rank. Generals are the tallest. Originally brightly painted, they are intricately detailed with armor, top knots, weapons and boots. No two figures are alike. Craftsmen are believed to have modeled them after a real army. A ruthless figure of fear and awe in Chinese history, Qin built an extensive system of roads and canals along with an early incarnation of the Great Wall of China. He unified measurements and established a single written language, currency and legal statutes. Critical thinking challenge: Why is the army made of terra cotta? The archaeologists might have been able to find the terra cotta warriors in one of the pits that contains that first Qin emperor which archaeologists had been planing to reveal more terra cotta warriors. The people might have been expecting to find more terra cotta warriors after some people had been able to go inside a pit and find a few terra cotta warriors inside the pit. The archaeologists might have been able to plan to reveal more of the terra cotta warriors which they would be able to reveal more the warriors and see what kind of warrior it is. People might have been able to see that the archaeologists are going to be able to find every last of the terra cotta warriors which they would be expected to find the tomb of the first Qin emperor. Critical Thinking Question: Why is the army made of terra cotta? Answer: I know that the army is made of terra cotta because it is the only soft material that turns dry before even more materials are found that are better than terra cotta. I think that the Terra Cotta warriors are pretty interesting. They were built to protect the first Qin emperor of China. There is a museum that has pits filled with the terra cotta warriors. There are also chariots and horses with warriors on them. The warriors' heights depend on the rank. The higher the rank, the taller the warrior. I have heard about the terra cotta warriors but now, I know more about them. I would like to see one in real life. I think that the army is made of terra cotta because terra cotta is used to make statues and is durable. The army is also durable and will stand their ground to protect the emperor.